A wave of new Red Dead Redemption 2 information recently hit the web. Red Dead Online has officially been revealed. Additionally, RDR2’s customization options are a huge step above those featured in Red Dead Redemption. Apart from styling his hair and swapping out clothes, there are other ways players can invest time into Arthur Morgan. He has to eat. In the event that he gets dirty, he’ll need washing. Considering these details and more, Arthur and his weaponry will require maintenance. A thread on ResetEra compiles a list of some of the most intriguing details to come out of Red Dead Redemption 2 previews. First-person mode is fascinating, sure. But the simulation aspects, though they are few, are equally interesting. For example, Arthur will get hungry over time; going too long without food negatively affects his health and stamina. Eating too much food does the same. Rockstar has laced the weapon systems with the same attention to detail. As time passes, Arthur’s guns will get dirty. Thus, they’ll clog up and require cleaning to function properly. Should his weapons get wet, similar rules apply. Arthur has needs, too, like eating and sleeping. As you play, Arthur gets hungry and tired over time. If you don’t eat or sleep, you won’t regenerate your health or stamina as quickly. It doesn’t seem to veer into pure simulation territory, but I did eat a snack before a gunfight just in case. 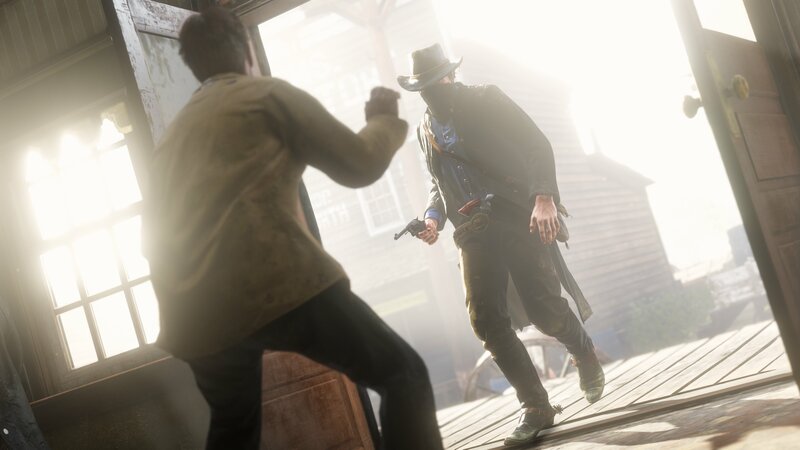 I can’t say for certain how it works over longer sessions, but Rockstar is adamant that, like the weapon cleaning, it’s not designed to be intrusive. Instead, it’s a way to remind players that Arthur is a person, and not just a hunk of meat that’s entirely self-sustaining. Over time, his hair and beard will grow, which you can shave at camp or get trimmed in town. Hairstyles and facial hair aren’t magically summoned when you plop into the chair, either. If you want a mullet or mustache, you’ll have to grow it and have it cut it to form. This doesn’t pack as much detail as Grand Theft Auto: San Andreas, where things were granular with weightlifting. Yet, Red Dead Redemption 2 probably still has many more surprises in store, bit and pieces that won’t be discovered until the game is in the hands of masses. Red Dead Redemption 2 launches on the PlayStation 4 and Xbox One on October 26, 2018.